Here is my list of top 3 areas in both positive and negative aspects that came through during these 100 days based on my understanding and belief. Foreign policy has definitely enjoyed an unseen importance since Modi took the power. While the previous regimes seemed passive in this aspect, it definitely is a time of pro-activeness from day 1 of this government. The advent of the regime started with a masterstroke of inviting the SAARC leaders to the oath taking ceremony – which took everyone by surprise given that event had historically been a domestic affair. This was the first glimpse of the look east policy of this PM which was followed by first international visits being to South Asian countries which though strategically important were largely ignored. This was followed by actively pursuing India’s assertiveness during the BRICS Summit and taking up key roles in most of the institutions emerging for the group. Following these with a successful trip to Japan where the PM not only brought over $35 billion of investment (over 5 years) but also won hearts of people both in Japan and India. Wrapping the 100 days with a Civil Nuclear Deal with Australia was definitely a sweet cherry on the top. The emphasis of Modi towards streamlining the government machinery was evident from his first day in office. The PM chose to visit his office right in time on his first day of office while most prime ministers in past chose to settle-in at their own pace. Ministers were made to reach their offices in time and ensure that bureaucrats are punctual too. It definitely sent the entire government offices into frenzy when ministers conducted surprise checks on attendance and took action against defaulter. The first thing Modi did was to talk to the bureaucrats directly to assure them of his support and to advise them to ensure they work diligently. There has been an active attempt to remove red tape within government, eliminate archaic laws/ rules, digitalize operations and set accountability. The PM has sent a clear message that while he favors empowering his ministers by disbanding GOMs and eGOMs, he also expects them to take accountability of their decisions. He uses new and innovative methods to check the effectiveness of his directions one of which I learnt recently. He calls ministers on their landlines to ensure they are in office and visits the ministries for some meetings to gain first-hand information of the environment of offices. The message is clear – he abhors any procedural delays and wants quick action and implementation. This is a dramatic shift from the perception of policy paralysis which marred most of the previous regime. These hundred days have brought a lot of basic issues which were until now kept on the back burner. It started with highlighting the sanitation facilities across the rural India. Bringing in the emotional and cultural values to the forefront to tackle some of the basic ills of society was an encouraging call by the PM. These may not be effective enough in short term but over time it is such shifts in attitude which can bring real change. Involvement of people has always been talked about but never taken to implementation. These 100 days saw myGov portal coming live where PM himself shows active participation. Reaching out to students throughout the country was another surprise thrown in by this leader. Similarly a targeted scheme for financial inclusion of the masses and bringing them into the ambit of main-stream financial institutional support was a heartening start. Focused approach on domestic manufacturing industry and asking for investment to bring with it the technology is another of the positives of this government until now. Initiating time bound inquiries for MPs and MLAs involved in serious criminal offences is a welcome start. The government seems to have taken small fights which do not matter in long run. These have definitely provided some initial stumbling blocks for the government. It started with the LOP issue where the government could have shown large-heartedness and went ahead with offering the position. In anyway BJP has a clear majority and LOP or not would not create any major difference for them. If there is a faulty precedence set in past, it needs to be amended not encouraged. Similarly the government had to spend a large amount of goodwill to take ahead certain controversial appointments. The first legislation that government brings is to remove a cooling period for TRAI chairman’s post, all to allow Modi to choose his principle secretary. I do not have doubt on the capability of the person, but if there is a control in place to avoid issues, it needs to be respected. Appointment of former CJI as governor was another link in this chain. Language issue was another controversy which could have been avoided. The PM is an eloquent speaker and no one doubts his ability in communicating his ideas. Though he has taken every opportunity of one-way communication he has strangely stayed away from the mainstream media for most part of the tenure. One could give him benefit of the fact that he has interacted with public extensively using the social media platform but even this has been subject to selective commenting. While the profiles of PM and his office beam with regular updates for his every move, they have surprisingly been silent of key issues. PM could have used these media to send strong message against various low key leaders trying to flare up communal divide. Similar commentary was required to ensure the embarrassing hooting of CMs in-front of the PM. The haste shown by the government in certain areas is definitely a concern and sends a perception that they are still in campaign mode. Firstly, the excuse of the ill-doings of previous government is not a shield they can use. Further, engaging with Pakistan and later recanting is something that should have been avoided. Rushing with introduction of Bullet Train when Railways is struggling with its own issues seems to be an less-thought of approach. Presently the way the government is handing the issue of Delhi assembly and state government formation is something that concerns me. It is clear that neither do they have enough numbers, nor do they enjoy open support from outside MLAs. It would be prudent to take Delhi to elections if the claims of doing right are to be believed. I agree that 100 days is too short a time to evaluate a new government and they justly deserve more time before we start passing judgments. However there definitely is a scope to establish views on individual actions of the government and that is all I have tried here. Moreover these are definitely not the only things government has done because the scope of ruling this diverse country is huge. All I have covered here are things which stood out from rest and could be bucketed into lists of goods and bads based on my criteria which are abstract at best. I believe that Modi has set the ball rolling for a brighter future overall but things are mostly at planning stage. The success of NaMo as PM would be judged by the extent to which he can take these to logical end where impact can be seen on ground. We were made to believe that implementation is forte of this PM and we would settle at nothing less from him. 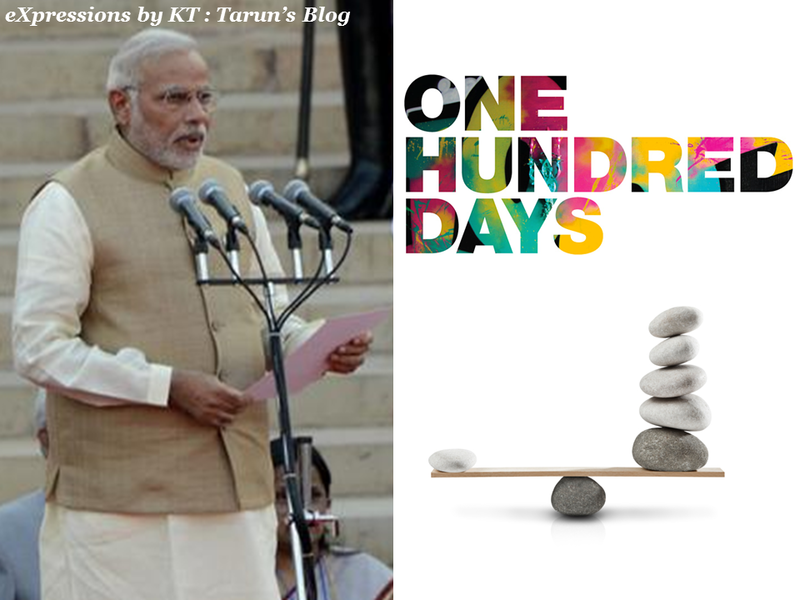 What are your highs and lows of Modi Government in these 100 days? Do you agree or disagree to my list? Feel free to point out absurdities in my views or brilliance of the logics in the comments section.